They're even specifically labeled: the band on the Genius shirt/hat reads "Men's Cap and Tee" while the band on the Cute shirt/hat reads "Women's Cap and Tee." I'm generally ok with the pinkifying of science. If creating bath salts in a home chemistry kit means more girls and women will get into science, that's great. But this display pissed me off. Men display their intelligence (which they are rewarded for), while women display their physical appearance (which we are rewarded for, but only if we make a patriarchal bargain). Not to mention, the men's display is taller - is it because men are, on average, taller than women, or is it because women's objects / women as objects are inferior to men? Seriously, there are so many things wrong with this display. Discovery Place is a science museum, one aimed at school-aged kids. Men = geniuses / women = cuties is absolutely the wrong message to send. Even if the gift shop is run or managed independently, I'm baffled as to why no museum staff questioned this merchandise. Perhaps, as an anthropologist with a 2.5-year-old daughter who so far loves science, I should write them a letter. Update (2/24) - I decided to send Discovery Place an email, through their contact form. What I wrote follows, but you can also send them an email if this post or the tshirts made you mad. I'm compelled to write this email in response to a merchandise display I saw in the gift shop this week. 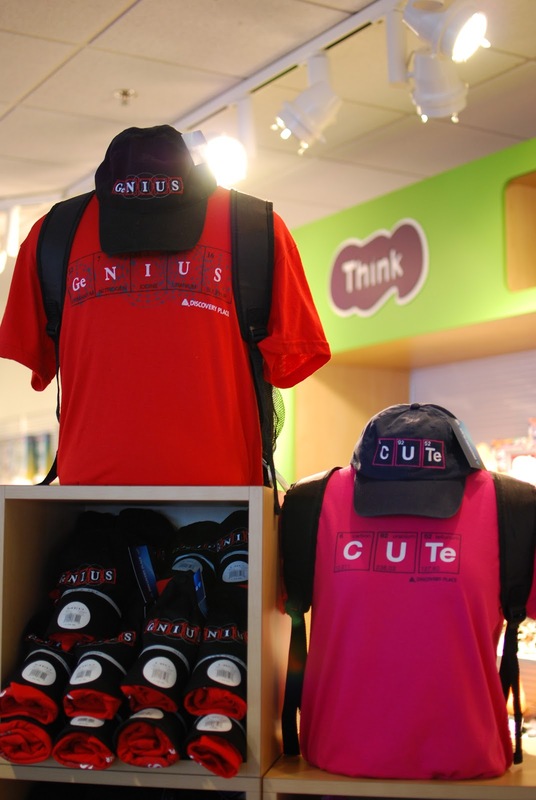 The display had men's tshirts/caps labeled Genius and women's tshirts/caps labeled Cute. It was baffling to me that, as a self-described "preeminent science education center," Discovery Place doesn't realize that this display is communicating an old and damaging gender bias in science. As a biological anthropologist, I greatly enjoyed the Mummies of the World exhibit. But as a woman, a scientist, and the mother of a 2.5-year-old daughter who loves science, I was chagrined at the idea that she and I can be "cute" but not "geniuses." I have blogged about both of these topics (my visit to the mummies and the gender-coded tshirts) at Powered by Osteons. Of course, I'd be happy to include your response as a coda to my "Women Are Cute, Men Are Geniuses" post. In closing, I urge you to reconsider selling such blatantly gendered items in your gift shop, as under-representation of women in science is a real problem. I agree with you 100%. A place of science should be the last place where this type of stereotype is promoted. As a father of an 11 year girl who is fascinated by archaeology, I share your opinion that this sends a very wrong message. In a continuous battle against illnesses like anorexia the image stereotyping of women has to stop. Those of us who share the love of science have to lead that battle! And yes right them a letter! PS: I love your blog! After I mentioned the display to my husband (who was making sure our daughter didn't destroy the other merchandise), he said, "That's ridiculous! Where is it? I'll take a picture of it." It was nice to know that it wasn't just my feminist-spidey-sense acting up. It's like Lake Wobegon, but warped? The women are cute, the men are geniuses, and the children are below average. Guys can't be "C U Te", too? Well, the guys can be C U Te if they want to wear a pink shirt (and ignore the band proclaiming the shirt for women). In searching for C U Te stuff on the interwebz, I only found it for women and babies (male and female babies, it seemed). I really enjoy reading your blog and I LOVED seeing this post! I am so glad that other people would also be shocked at these shirts! I am so surprised at these stereotyping shirts sold in the Discovery Place gift stores. We need more women wanting the to be geniuses, not just cute! I think it is awesome that you wrote them a letter! Thanks, Martin & MsSecAF! I'm hoping the museum writes me back. They promise to answer all emails within two weeks' time. If they do, I'll post their response here. Wow. I imagine it will take the full two weeks to invent some sort of justification for this. I'm sending a link to my first year sophomore science-interested daughter. She's going to LOVE this! As a fellow woman, and a fellow scientist, you really need to lighten up. I thought your blog was here to state scientific facts, not your fashion opinions. If you don't like it, don't buy it. This will be the last time I will ever read your blog. Totally lost all respect for you. a bunch of my friends have started being mothers and begun to notice. My reaction: I'm horrified. There is something deeply wrong with people who think that is OK. Thanks for the tip, Francis! I just subscribed to the blog. And as a man, and a father of two daughters, this display horrifies me. I thought the purpose of science was to examine things objectively and critically, not just go with the status quo. If you are indeed a scientist, Anonymous, then I wonder how it is that you don't recognize how damaging to science it is that such attitudes are displayed and reinforced in, of all places, the gift shop of an institution devoted to science.